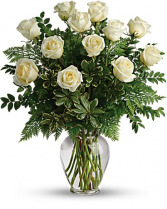 Pure Love shown in soft white roses reaching elegantly above a lush nest of varied greenery. All roses are shown facing front in this photo, BUT when arranged are spread front & back. 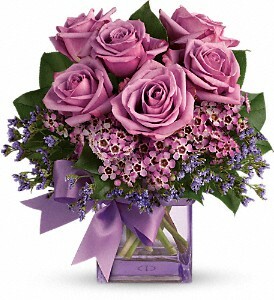 **To get this look shown, order at Price #2** Price #1 = 12 roses, Price #2 = 18 roses Price #3 = 24 roses and larger vase. 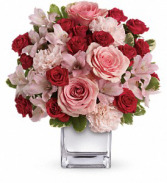 This impressive bouquet includes 2 pink roses, 2 red rose spray, pink alstroemeria and3 pink carnations accented with assorted greenery. Delivered in a mirrored silver cube. 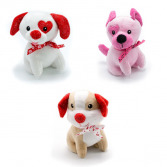 Approximately 12 1/2 W x 13 1/2 H Send your love to Elizabeth, Irwin, or any of our many delivery areas!